From left, Sheila Hull-Freeman, Alma Johnson and Carol Ruffo, neighborhood leaders in Atlantic City. ATLANTIC CITY – Standing before the all-male City Council with the state's overseer, Timothy Cunningham, to their left, the three female leaders from the Bungalow Park, Chelsea Heights, and Venice Park sections of Atlantic City made their intentions crystal clear. 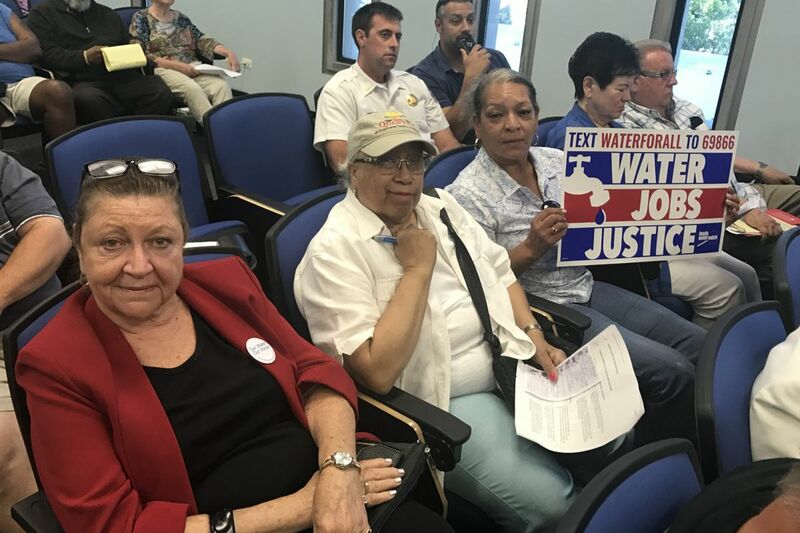 Either the 2,421 signatures they and 119 volunteers had collected and turned in to the city clerk Wednesday — twice the required number, they say — would result in a Council ordinance giving residents the right of a referendum if the state moves to sell or lease the municipal water authority, or, "We go to court," said Carol Ruffu of Chelsea Heights. Sheila Hull-Freeman of Bungalow Park urged the Council not to avoid acting just because the state, with its vast powers over the city due to a takeover law, might try to prevent a resolution from being introduced, or might veto it afterwards. "We have stood strong with our city government, always respecting the sovereignty of our city government even when no one else did," Hull-Freeman said. "We really need our city government to accept the resolution put forth on behalf of all the signatures collected. "If it has to go beyond this point, " she added, "we will see you in court." Added Alma Johnson of Venice Park, turning to look at Cunningham: "We are sick and tired of it." It was striking to see the three assert power before the all-male Council and state overseers. The middle-class enclaves they represent along the back bays and canals are often overlooked in discussions of the casino-dominated town. Ruffu said the grass-roots effort had grown in momentum as petitions were circulated door to door with the rallying cry of stopping Gov. Christie from moving to sell the Municipal Utility Authority, valued at $100 million. The petitions are about twice what is required by law — up to 15 percent of the number of city voters who voted in the last Assembly election — to force an initiative and referendum. "We came out on Saturdays. We had help from faith-based churches, residents working in their neighborhoods, volunteers from Food and Water Watch and the Green Party. Boston, Pennsylvania, Delaware, Maryland and Washington, D.C.," Ruffu said. "This was viewed nationally as a movement, and all eyes were on Atlantic City," she said. "The citizens went out there, the voters of Atlantic City turned in 2,421 signatures, and I'm very proud of that." Council President Marty Small Sr. said that if the clerk certifies the required number of signatures, the Council would vote on a resolution that would authorize a referendum on any sale or dissolution of the MUA. "We'll put it on the agenda for a vote," he said. "The state can overrule anything we can do. We're going to move forward for the people of the city of Atlantic City." Cunningham called the petition drive "premature," and said the state had not made any decisions regarding the utility. On his last visit to the city, Christie seemed to have softened his stance on a sale, noting the desire of residents to keep it in public hands. Several water companies with political ties have expressed interest. "We haven't done anything," Cunningham said. "We haven't made a determination of what to do." The Municipal Stabilization and Recovery Act, in addition to giving the state veto power over Council actions, says any referendum would be considered advisory. But Lena Smith of Food and Water Watch, who has been organizing in Atlantic City for a year, said civil rights attorneys were prepared to challenge that part of the law in court. She said the petition drive was not premature, but proactive. "This ordinance is about getting back the rights that were lost when the state takeover law was passed," Smith said. "It's about citizens' civil rights. We want to make sure we have the right to control our water, which the state takeover law does not clearly state we have the right to do."